Book Review It has been 14 years since Google IPO'd, and nine since Donald Trump burst onto Twitter. It’s five years since both the Snowden NSA disclosures and the birth of Cambridge Analytica. Over this period we’ve had a series of major data breaches, media organisations disrupted out of existence, and the emergence of hacktivists and the alt right. Tech, both big and small, keeps smashing its way into our lives leaving at least some of us too punch-drunk to take stock and think about who or what exactly is driving this change, and what it’s doing to us. That’s even assuming we want to, given the lurking suspicion that what we’ll find there is even worse than we imagine. 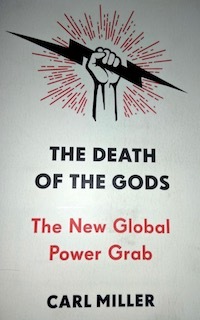 Luckily Carl Miller has dived into the murkiest depths of the net in his first book, The Death of the Gods; The New Global Power Grab. The Gods in question are the structures and institutions that have governed and shaped our world for living memory, even centuries: democratic government; business; press and media; crime and policing. These are the structures in which “power” has resided, and through which it is exercised. Carl has form in this space. He is co-founder and research director of the Centre for the Analysis of Social Media at left-leaning thinktank Demos, and has a broad view of how politics and society worked long before the internet messed things up. Some of this will be familiar territory. One of Carl’s first stops is the Tech Model Railway Club at MIT. From there he takes in the leaders of Silicon Valley, and the cult of the founders who often see themselves as the true descendants of those original hackers. He details how big tech tends towards monopoly, and the rise of the algorithm-powered data scientist has accelerated this trend - and how the founders and innovators seemingly don't seem to notice the impoverishing effect they're having on those Silicon Valley residents without the benefit of a maths or computer science background. Less familiar, perhaps, will be characters like Burim, the proprietor of Pristina, Kosovo fake news factory which turns over as much as a few thousand Euros a day (meaning he’s one of the few characters who offer to buy Carl a coffee). Or Marianne Grimmenstein, a 70-year-old German woman who used change.org to force changes to the Comprehensive Economic and Trade Agreement that would preserve the role of government. He also takes a close look at the ways in which technology have changed warfare, from Russia’s theory of hybrid war, using disinformation, sock puppets, and even, yes, fake news. And on the other side, he visits GCHQ and the UK’s 77th Brigade. Of course, the latter organisations will see themselves as defending truth - or at least a version of it –that will seem familiar to us in the West. It’s a massive undertaking. But is it telling us anything we don’t already know? But Carl brings wider context and nuance that observers coming from the business or tech end of journalism often miss out. When he talks about sovereignty, it is rooted in a real concern for where political legitimacy comes from - not another all-caps slogan in a sock-puppeted social media post. He also conveys real terror at some of the effects this is all having. His concern for how big tech is undermining our privacy and our politics is clear - and justified. What might be more unexpected is his clear concern over the effect of cybercrime - both in its effects such as the dehumanizing nastiness of having your intimate personal photos hacked or the point-and-click ease with which you can set yourself up in the ransomware game - and the fact that many of the police he speaks to are quite open about the fact they are simply not getting on top of the problem. Is it beach-reading material? Well, summer’s almost over. But Westminster and Washington are about to spark back into life, the cyber criminals and fake news merchants will come back from wherever they take their breaks, and the marketing algorithms have already worked out what you want for Christmas. Former! AOL! chief! reportedly! mulling! Yahoo! bid!